Julia holds her perfected chocolate cupcakes along with a salted caramel topping, which was part of a bake sale for GSA (Gay Straight Alliance). Many people have passions in lives but few actually do something about. Julia Thurau is an exception. She’s just a junior in high school and is running her own cupcake business: Messy Apron Cupcakery. At a very young age, Thurau was able to discover her passion, and she has since been pursuing it. “Since Julia was a young girl, she loved spending hours baking in the kitchen. She has always spent any free time in the kitchen being creative and making cakes and cookies. Julia started this business completely on her own. In fact, she had her website up and business cards made before I even knew about it. She is determined when there is something she wants to do,” Mary Jane Thurau, Julia’s mom, stated. As her business began to grow, Thurau became worried that her business may run into problems interfering with certain health department codes. “I had started getting into cupcakes. I enjoyed experimenting with flavors, and I was like, ‘you know, I could sell these, like that would be kind of cool.’ So, I made a website and was all ready to go, but then I was like, if I have a food business, there are health department rules that I need to comply with. A week later my mom came and said that she heard about this thing called the cupcake bill and it was passed by a 12-year-old girl in southern Illinois, and she had a cupcake business, which got shut down by the health department. So, she talked to the governor of Illinois and she got a bill passed. Home businesses that produce food products under $1,000 a month don’t have to jump through all the health department rules,” Thurau stated. It’s common for people to want to start a business for the money aspect of it, but Thurau’s drive for starting a business wasn’t the money side of it, but the cupcake side. ​”It wasn’t like I wanna start a business, what should I do? I love cupcakes; let’s start a business. The cupcakes always came first,” Thurau stated. As Thurau approaches her senior year, she has started thinking about possible career paths. “​I have considered that (a cooking career). I was considering for a while going to culinary school just because I enjoy it so much. But I’m going into education to be a teacher, so I’m thinking sometime in my life maybe when I retire, like years and years from now, maybe that would be something I could go into, but for a career right now, it’s just something I enjoy doing,” Thurau stated. Thurau has mastered her most well-known cupcake flavors, but also bakes a variety of interesting and original flavors. “My absolute favorite is my chocolate and vanilla. I looked up a lot of different recipes, and I’ve perfected them. So, those are probably my favorite ones. Generally people want the basic flavors. I also have lemonade, red velvet, and Skittles,” Thurau stated, mentioning chocolate and vanilla are her best sellers. Thurau’s cupcakes don’t just taste good, but they also look good. She is dedicated to the perfected combination of flavors along with attractive decor. Julia Thurau enjoys putting time into her decorative cupcakes. “She has a terrific instinct about what flavors will taste great together, and she has a powerful attention to detail in cupcake decorations. I think that people really like to support a young person starting out, and she has had lots of attention and support from people in Libertyville, “ Mrs. Thurau stated. Making cupcakes may seem like a simple task to some, but it requires hours of dedication. “If I have a big order, it will take longer, but to make a dozen, it would take 3-4 hours. I have to mix them, then bake them, then make the frosting, then frost them, and wait for them to cool. If I want to do frosting, I have to pipe those and get them ready,” Thurau stated. In addition, Thurau is president of her club Advocats: a women’s rights group that deals with societal problems when it comes to gender inequality and empowerment. Even with all her responsibilities in school, Thurau is still able to devote enough time to run a business. “It is kind of tricky managing a business and school. I don’t get a ton of orders during the school year, which is good, because of homework and stuff. There have been nights when I have been up to midnight on a school night rolling fondant (thick paste used to decorate cakes) and I’d still have math to do. It’s definitely hard to juggle, but I roll with it,” Thurau stated. There are several factors that people must have to run a successful business. One of the most important ones is pure happiness of what’s being done. 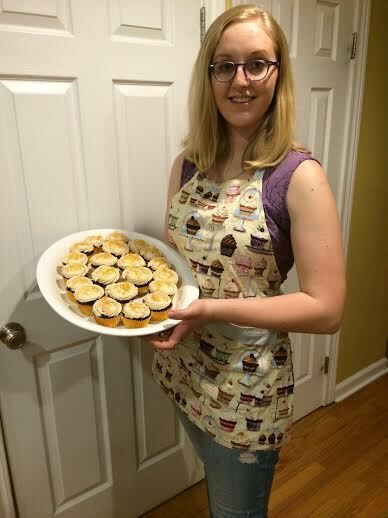 “Julia is happiest when she is baking delicious and beautiful cupcakes for people. Baking and decorating hundreds of cupcakes from scratch takes a very long time and is physically taxing. You have to really, really love it and she definitely does,” Mrs. Thurau stated. Thurau isn’t just known for her cupcake business, but also for her kind spirit. “She is one of the nicest people you will ever meet. She’s one of those people that you know will be a great teacher, she’ll be a great mom, like we call her the ‘mom’ of our group. She is so nice, she is so selfless, and she will give everything up for you,” Julia Wilson, a good friend of Thurau’s, shared. Thurau adds a unique twist to her business by baking creative cupcake flavors, which differentiates her from other cupcake businesses. “She’s not just trying to make chocolate cupcakes. She’s trying to put a spin on it no matter what it is. She made honeycomb cupcakes. She’s made blood orange cupcakes. She tries to make them really unique, so when you’re eating these cupcakes, it’s something that you can’t get somewhere else. You can’t just go to Sunset and buy them. 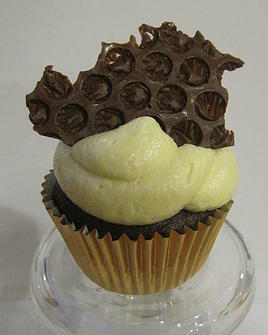 She does make chocolate cupcakes, but when she does make those innovative flavors, it’s really cool,” Wilson stated.